EDUCATION: Boston College (B.A., Psychology 2003); University of Puerto Rico School of Law (2006). 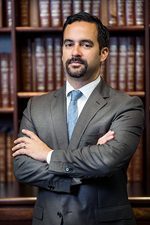 REPRESENTATIVE CASES: Sara Cortés v. Wesleyan Academy, 2015 TSPR 40; W Holding Company, Inc. v. AIG Ins. Co.-Puerto Rico, 748 F.3d 377 (1st Cir. 2014); Nieto-Vincenty v. Valledor, 984 F. Supp. 2d 17 (D.P.R. 2013); Andreu v. Palmas del Mar Homeowners Association, Inc., 311 F. Supp.3d 456 (D.P.R. 2018); Morgan v. Water Toy Shop, No. CV 16-2540 (PAD), 2018 WL 1725550 (D.P.R. 2018).